Shared Events provides the ability for Event Organisers to mark an Event as "sharable" and for other Organisations to add this Event to the eCal Calendar. 1. Hover over Events and click List Events. 2. On the right hand side of the page, click the Add button. 3. 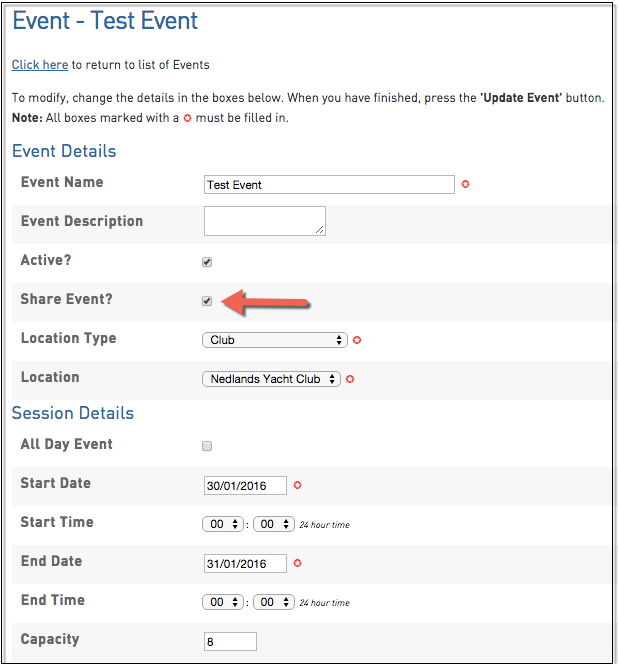 While filling out the Event information, ensure the 'Share Event' box is ticked. 4. Click Create Event, when finished. 1. Hover over Events and click Manage Shared Events. 2. You will see a list of Events that have been marked as "Shared" events. - Next to each Event there is an "Add to eCal" button. Selecting this button will add the Event to the Organisations eCal Calendar, provided that organisation has an eCal calendar set-up.